On past trips to Seattle I had read several good reviews of Ping’s on Yelp and in the Seattle Times and decided to try the spot on my next trip. Ping’s started out as a market with a small dumpling counter in the back and has since cut back the space dedicated to groceries to make room for a small dumpling cafe area on one side of the store. Since I was staying with a group of people and we were going to be eating big family style meals, I decided to try Ping’s frozen take-out dumplings, ~$12.00 for 50 dumplings. The Dumplings: Ping’s serves eight styles of dumplings for eating-in, including: pork and napa cabbage; pork and chive; beef and yellow onion; lamb with carrot and green onion; shrimp, pork and napa cabbage; wood ear fungus, tofu, chive and egg; and mixed vegetable. The menu also notes there are 20 varieties of frozen to-go dumplings and considering the list the server ran down for us, this number is probably about right. 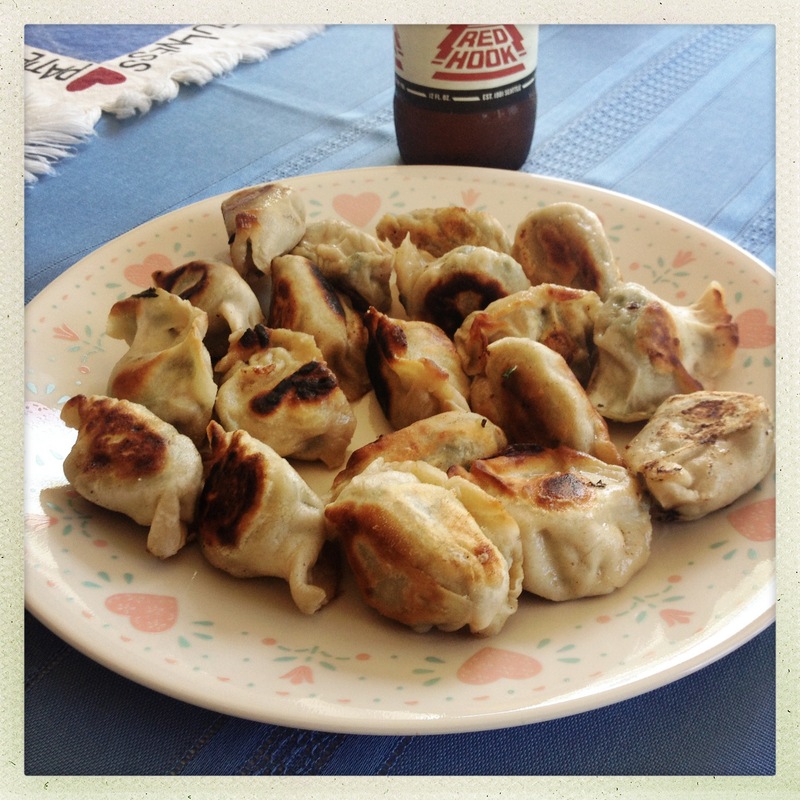 I got the pork and chive and the vegan mixed vegetable dumplings – both of which were a bust. The pork and chives dumplings had about twice as much chives by volume as pork and also had glass noodles mixed into the filling. Straight from the freezer, these dumplings pan-fried up really nicely and had a really good chive flavor with the pork in a supporting role. However, they were really salty so it was hard to eat more than three or four of them in one sitting. The vegan version of the vegetable dumplings (the rest of the dumplings have egg in the wrapper dough) did not cook up well. The wrappers were mushy and gooey both when steamed and when pan fired, in fact no reasonable amount of pan frying seemed to be able to crisp up the wrappers. The weird mouth feel of the wrappers overwhelmed whatever positive flavors the filling might have had. The Sauce: the to-go frozen dumplings did not come with a sauce, and given the level of salt in the pork and chive dumplings, I would avoid soy based sauces, they will only take the salt coefficient up to 11. Location: Ping’s is in Seattle’s International District on S. King Street. This entry was posted in Chinese, Seattle, Vegan, Vegetarian. Bookmark the permalink.